Music is a ubiquitous human endeavor that cuts across diverse cultural differences. Whether it’s actively participating in making music or just listening to our favorite songs, we have probably all felt the impact that music can have on our mood. Maybe you have a favorite ‘chill’ playlist to help you relax on the commute home after a hard day at work. Perhaps you go to your local bar and take part in the weekly acoustic jam session. Why? Because it makes you feel good. The concept of using music to promote a positive mental state isn’t new. In civilizations throughout history, music has been used to heal illness and promote well-being. This practice of healing through music and rhythm continues in cultures all over the world. Can it Help with Depression? Can it Aid in Stress Relief? Can it Help with Schizophrenia? How Can it Help Cancer Patients? Music therapy is a research-based practice in which music is used to actively support people as they strive to improve their health, functioning and well-being. Engaging with music can evoke a wide range of emotions and act as a welcomed distraction from negative experiences. The following are just some of the empirically-backed benefits that music therapy can yield. The following studies are just the tip of the iceberg when it comes to peer-reviewed literature that supports the positive role of music creation in regards to an individual’s mental state. The act of engaging with the creation of music has been found to motivate and empower people. Motivation is central to achieving one’s goals, in its absence our personal drive to succeed and our readiness to act on opportunities is greatly diminished. Actively engaging in music making can alleviate many of the negative symptoms associated with mental health issues such as low motivation, social withdrawal, diminished affective experience and responsiveness (Ghetti, 2004). While there are times in life when we feel lonely and isolated, for some this is an experience that endures. Long episodes of isolation and social withdrawal can be detrimental to mental health, increasing the likelihood of developing mood disorders such as depression. Community music therapy sessions have been shown to decrease feelings of isolation, enhance creativity, and improve quality of life by promoting the perception of connectedness (Baines & Danko, 2010). After experiencing a traumatic event, many people will gradually heal and recover from the emotional pain. But what happens if we can’t get past these debilitating emotions? Unresolved exposure to trauma can lead to mental health problems such as PTSD and depression. Music therapy provides individuals with an opportunity to be listened to, to find ways of managing distress, and to communicate experiences that are not always easily put into words (McCaffrey, Edwards, & Fannon, 2011). Participation in group music therapy such as singing or playing an instrument with others has been found to have positive impacts on social interactions, communication skills, well-being, hope, and optimism (Clift, 2012). Music therapy is associated with increases in perceived enjoyment, happiness, enhanced quality of life and improved mental health (Rio, 2005). Carefully structured music therapy sessions enhance the potential for positive experiences, leading to positive effects on factors such as self-esteem or self-efficacy (Hohmann, Bradt, Stegeman, & Koelsch, 2017). Self-esteem is important for mental health; if we don’t believe in our own self-worth can we ever really reach our true potential? Individuals with an external locus of control regard experiences as a result of external factors. This perceived lack of control contributes to feelings of helplessness and vulnerability. Over time, music therapy has been shown to encourage an internal locus of control. When individuals come to understand that their own abilities and actions determine the outcome of music therapy sessions, this can be extrapolated to life outside the therapy setting (Hohmann et al., 2017). Even short sessions of music therapy can enhance the effects of psychological support and ameliorate depressive symptoms (Castillo-Perez, Gomez-Perez, Velasco, Perez-Campos, & Mayoral, 2010). Engaging in music therapy has been likened to grounding yourself in reality, replacing states like fear and anxiety (Podolsky, 1954). The benefits of music therapy for mental health closely resemble the recognized benefits of a recovery-oriented practice. Through the encouragement of awareness and self-determination, we can foster mutually empowering relationships (Solli, Rolvsjord, & Borg, 2013). Smith (2004) suggests music therapy has the potential to evoke relaxed states that include feeling; engaged, rested, and refreshed, at ease, energized, mentally peaceful, thankful, and loving. The goal of music therapy is to elicit changes in behavior, with a focus on interventions that contribute to a positive mental state. Advances in technology in the realm of neuroimaging have allowed researchers to understand the neurological mechanisms and effects that music has on the brain, demonstrating that music processing is distributed throughout the cortex, subcortex, and cerebellum (Peretz and Zatorre, 2005). This distributed nature of music in the brain allows preservation of musical functions despite the loss of a related non-musical function, in cases of Alzheimer’s, for example. Dopamine plays a major role in reward, motivation, and pleasure. Musical pleasure is closely related to emotional arousal, suggesting that musical reward is dependent on dopaminergic neurotransmission within a similar neural network as other reinforcing stimuli (Chanda & Levitin, 2013). Neuroimaging technology has been used to probe the functional activation, network connectivity, and central dopamine release that occur during music therapy. Simply listening to music has been shown to lower requirements for opiate drugs in postoperative pain and other medical treatments (Nilsson, Unosson, and Rawal 2005). These findings suggest that music may stimulate the release of endogenous opioid peptides within the brain (Chanda & Levitin, 2013). While further research in the area is warranted, the ramifications of these initial findings could be vast in terms of analgesic interventions with regard to pain-management. Cortisol – the brain’s built in alarm system – is mainly released at times of stress and arousal. 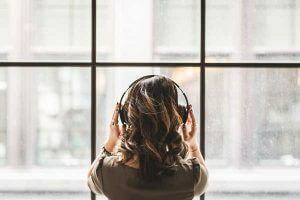 The potential therapeutic effects of listening to music have been largely attributed to its ability to reduce stress and regulate arousal levels. 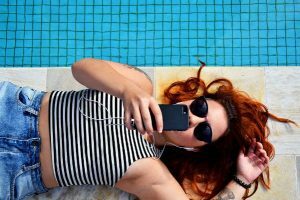 Listening to ‘relaxing music’ (generally considered to have slow tempo, low pitch, and no lyrics) has been shown to improve overall well-being, while reducing stress and anxiety by alleviating cortisol secretion (Hou, Lin, Lu, Chiang, Chang, & Yang, 2017). Serotonin is often referred to as the ‘happy chemical’ and plays an important role in happiness, well-being, and numerous physiological processes. Low serotonin levels are linked to anxiety, depression, low self-esteem, and irritability – research involving the study of neurotransmitters suggests serotonin levels within the synaptic cleft increase during enjoyable musical experiences (Trainor & Zatorre, 2016). The oxytocin system operates in parallel with stress response systems and cardiovascular regulation – low levels are related to pain and anxiety. The production of oxytocin is known to decrease anger, fatigue, anxiety and pain. Listening to pleasurable music has been shown to significantly increase levels of oxytocin and self-reported levels of relaxation in post-surgery patients (Nilsson, 2009). Autism spectrum disorder is characterized by severe impairments in social functioning and reciprocation, deficits in speech and language, as well as behavioral manifestations such as habitual repetitive movements and distress during environmental changes (Boso, Emanuele, Minazzi, Abbamonte, & Politi, 2007). Interactive forms of music therapy use musical experiences – to positive effect – to address some of these core impairments and improve social interactions, verbal and nonverbal communications, initiating behaviors, and social‐emotional reciprocity. The use of improvisational ‘hands-on’ music therapies such as singing, composing, and exploring sound through playing musical instruments is effective as a non-verbal means of communication for adults with autism. After an eight week program consisting of 90 minute weekly music sessions, post-therapy measures showed a significant increase in self-esteem, reduced self-reported anxiety, and more positive attitudes toward peers (Hillier, Greher, Poto, & Dougherty, 2011). Autistic Spectrum Disorder affects between 1 – 2% of people across all racial, ethnic, and socioeconomic groups, with 1 in 59 children being diagnosed with developmental disabilities (CDC, 2014). Children with autism do not readily engage in positive affect exchanges such as smiling and laughing with others in social situations. While these difficulties are proposed to be a core deficit in children with autism, many show no deficits in the perception and interpretation of emotion in musical stimuli, despite their social and interpersonal behavior seeming to imply otherwise (Heaton, Hermelin & Pring, 1999). Improvisational music therapy approaches do not fit into a set structure, rather the structure is created by the child and provides a non-threatening environment in which new methods of communication and self-expression can be developed. In fact, when comparing improvisational music therapy to therapeutic play sessions, children with autism demonstrated more instances of emotional expression and social engagement. Research also suggests these improvisational sessions encourage improvements in social timings, more and longer expressions of joy, improvements in emotional synchronicity, and a spontaneous willingness to respond, initiate and engage further (Kim, Wigram & Gold, 2009). Dementia is a global health issue and so much more than the debilitating failure of memory. Alzheimer’s and other neurodegenerative diseases have profound consequences on the emotional and social functioning of people in their daily lives. There are currently around 50 million people worldwide living with dementia and it is estimated this number will double every 20 years (Alzheimer’s Disease International). Interestingly, individuals with neurodegenerative diseases rarely exhibit deficits in the processing of music. In fact, evidence suggests that the appreciation and perception of music is often preserved in persons with dementia (Johnson & Chow, 2016). This preservation of perception can be used to reconnect with memories and emotions, and as a new avenue for communication through music. In recent years, non-pharmacological interventions such as music therapy have been researched and implemented as an effective supplementary tool in the treatment of behavioral and psychiatric symptoms of dementia such as apathy, delusions, hallucinations, agitation, and disturbances to motor skills (Raglio, Bellelli, Traficante, Gianotti, Ubezio, Villani, & Trabucchi, 2008). Furthermore, music therapy has been found to alleviate self-reported anxiety, improve spontaneous speech content, attention, and language fluency in patients – including those with early onset dementia (Johnson & Chow, 2016). Creative therapies involving music also actively facilitate physical exercise through movement, and reduce feelings of isolation by encouraging social interaction within group activities. There is a growing body of research supporting the use of music therapy in a range of settings, particularly within health and social care. So what does the research tell us about the effect of music on our physical and psychological functions? Music therapists can use music to facilitate more functional, coordinated, and higher quality movements in fine and gross motor skills including motor control, gait training, and body awareness (Malchiodi, 2016). Impairments to motor skill functions are common in cases of stroke and traumatic brain injury. Thaut (2005) suggested that rhythmic entrainment (where rhythm is used as an external timekeeper to organize, coordinate, and improve movement) of motor function can facilitate the recovery of movement in patients with Parkinson’s disease, cerebral palsy and traumatic brain injury. Music-supported therapy has also been shown to lead to more pronounced improvements of motor functions after stroke with respect to speed, precision, and smoothness of movements than other motor training methods such as conventional physiotherapy (Schneider, Müünte, Rodriguez-Fornells, Sailer, & Altenmüüller, 2010). Music therapy can be applied in the cognitive rehabilitation of neurologic conditions to improve attention, memory, and executive functioning. Musical Attention Control Training is a technique used to primarily target attention functions through a combination of structured musical exercises and improvisation. Such interventions can increase attention in children by around 11% (Thaut & Hoemberg, 2014; Dewi, Rusmawati, & Ratnaningsih, 2015). Furthermore, integrated music therapy and recognition training shows a significant improvement in cognitive scores and a decrease in subjective stress levels in older adults (Sawami, Kitamura & Suisha, 2018). Music therapy provides multi-sensory stimulation, diverting attention from external influences to touch, sound, vision and movement in the here-and-now. Research into the impact of music-centered sensory stimulation programs suggest that music has a significant impact on the improvement of consciousness in patients recovering from coma, for example (Vanhaudenhuyse, Demertzi, Schabus, Noirhomme, Bredart & Boly, 2010). Previous studies with consciousness disorders showed that music enhanced arousal and attention when compared to white noise or disliked music (O’Kelly, James, Palaniappan, Taborin, Facher, & Magee, 2013) suggesting a potential impact of music therapy on consciousness recovery. Additionally, music therapy is a particularly useful sensory intervention in reducing agitation, aggression, fatigue, and depression in people with Alzheimer’s (Iwata, Volmer, & Zarcone, 1993). Music therapy plays a significant role in the diagnosis and treatment of children and adults with pervasive developmental disorders (Wrigam, 2000). Often revealing core impairments within communication, music therapy aids the development of nonverbal communication through humming or singing, and of verbal communication in people with dysfunction or delays in speech. Singing has a fluency-enhancing effect because of its lengthened phonation, familiarity of lyrics, and intonation. Through the use of Melodic Intonation Therapy, significant improvements were found in the phrase length, noun retrieval, and verbal imitation of children exhibiting developmental apraxia (Krauss & Galloway, 1982). Speech disorders such as stuttering cause disruption to the normal flow of speech. 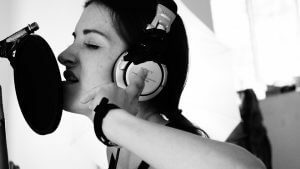 While the causes of stuttering may be varied, music therapy techniques such as rhythmic speech cueing and therapeutic singing are commonly used to improve speech fluency. Adult stutterers asked to sing familiar songs for ten minutes were found to exhibit changes in speech pattern characteristics and a reduction in the frequency of stuttering by an astounding 90% (Andrews, Howier, Dozsa & Guitar, 1982). Music therapy interventions facilitate social competence in relation to reciprocity, peer relations and self-management in children and adolescents with social deficits (Gooding, 2011). Such interventions provide a structured environment in which individuals are given the opportunity to develop more socially appropriate emotional expressions. Research into the influence of therapeutic group singing on the behavior of Alzheimer’s disease patients found that social behaviors such as verbal participation were significantly higher after treatment. Music is engaging and highly motivating and has been identified as an effective non-pharmacological intervention to improve motivation and quality of life in long-term care settings (Olderog-Millard & Smith, 1989). An estimated 300 million people live with depression globally (World Health Organization, 2017). With symptoms including anxiety, dysfunctional communication, low self-worth, and in severe cases, suicidal thoughts – suffering from depression can be debilitating. Improvisational music therapy, where music is created spontaneously either alone or as a group, means there is an absence of rules regarding how or what to play. It is more like playing and exploring with sounds and expressing emotions, thoughts and ideas through sounds. This kind of unstructured, self-expression through music and sounds enables an individual with depression to better connect with their emotions. Developing creativity, expressive freedom, spontaneity and playfulness through music introduces nonverbal channels of communication and a bridge to verbal communication (Bruscia, 1998). Musical interventions improve depressive symptoms to a greater extent than psychotherapy alone (Castillo-Perez, Gomez-Perez, Velasco, Perez-Campos, & Mayoral, 2010). While medication and psychiatric counselling are commonly used in the treatment of depression, even relatively short sessions of music therapy have been shown to enhance the effects of existing psychological support. There is a growing body of literature focusing on the value of music therapy for people with emotional and behavioral disorders such as Attention Deficit Hyperactivity Disorder (ADHD). Exhibiting symptoms such as inattention, impulsivity, impatience, disruptive behavior, and hyperactivity, ADHD is conservatively estimated to occur in 3% to 6% of children, and is predominantly identified in males (Barkley, 1998). While the presentation of ADHD may change over time, it encompasses the lifespan from children through adolescence and into adulthood (Tannock, 1998). Rickson (2006) suggested that improvisational music therapy for ADHD in small groups significantly improves attention, concentration, self-control, listening skills, and the ability to attend and engage in group activities. Music therapy with an emphasis on emotional needs provides important opportunities for those with ADHD to express themselves and to control their actions, particularly when experienced earlier in the day before arousal is increased by the environment (McFerran, 2012). Post-traumatic Stress Disorder (PTSD) is a condition characterized by enduring symptoms of distressing memory intrusions, avoidance, emotional disturbance, and hyperarousal after trauma exposure. Music therapy can be a useful therapeutic tool to reduce the symptoms associated with PTSD and strengthen functioning by fostering resilience and engaging individuals who may struggle with any perceived stigma associated with seeking professional help (Landis-Shack, Heinz & Bonn-Miller, 2017). A six week music therapy intervention for veterans of war found that weekly individual and group sessions were effective in reducing symptoms of depression and improving health-related measures of quality of life (Dillingham & Zablocki, 2010). This study highlighted the effectiveness of musical interventions and culminated in the formulation of the ‘Guitars for Vets’ program in which music therapy is advocated for veterans experiencing PTSD after severe emotional trauma linked to combat exposure. Music therapy has also been successful in helping children and young adults reduce symptoms of grief and loss associated with PTSD after traumatic experiences such as bereavement (Hilliard, 2008). Anxiety can impact people in a number of ways, from sleeplessness and heart palpitations, to irritability and difficulty concentrating. Gadbury (2011) examined the effect of rhythmic music therapy on state anxiety levels. Subjects who listened to a steady beat of 66 bpm reported less anxiety than those who sat in silence, suggesting that a steady beat alone can positively impact self-reported levels of anxiety. Working alongside British band Marconi Union, therapists of the British Academy of Sound Therapy created a song with the specific aim of ameliorating symptoms of anxiety and stress. ‘Weightless’ is a specially designed, carefully arranged piece of music with therapeutic elements woven into the structure. Beginning with five minutes of continuous rhythm and continuing with underlying low bass tones at a rate of 60 beats per minutes, the music allows the heart, blood pressure, respiration and brainwaves to be lulled into deep relaxation. In fact, listening to ‘Weightless’ decreased anxiety levels by an average of 65% (Lewis-Hodgson, 2011). It has been suggested that music therapy has beneficial impacts on health via its stress-reducing effects, with even passive listening impacting the psychobiological stress system (Thoma, La Marca, Bronnimann, Finkel, Ehlert & Nater, 2013). Smith & Joyce (2004) examined the effect of music therapy relaxation activities at home. Participants listened to Mozart’s ‘Eine Kleine Nachtmusik’ and reported greater levels of mental quiet and peacefulness, feeling more refreshed and energized, as well as higher levels of thankfulness and love within just three sessions. Neurocognitive research has identified the potential positive effects of music therapy on stress relief and management. By testing salivary cortisol levels, it has been observed that listening to music with major key tonality reduces stressful conditions such as mental fatigue while simultaneously inducing emotional responses similar to happiness or a pleasant experience (Suda, Morimoto, Obata, Koizumi, & Maki, 2008). Music therapy has been shown time and again to be beneficial within a hospital setting. Patients receiving ventilatory assistance within intensive care units (ICU) exhibit significantly less anxiety and increased relaxation after just a single music therapy session (Chlan, 1998). Passively listening to music has been found to lower blood pressure, heart rate, respiratory rate, and pain in patients with coronary heart disease (Bradt, Dileo & Potvin, 2013). 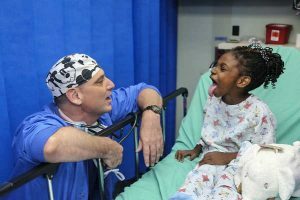 Pediatric hospitals often provide music therapy to enhance the physical and emotional well-being of young patients, while simultaneously nurturing a child’s sense of normality. Infants placed in a newborn ICU were found to be receptive to music therapy techniques. Music stimulation three times per day reduced initial weight loss, increased formula intake, and significantly reduced the length of stay within the unit when compared to newborns not exposed to music therapy conditions (Cain, 1991). Acquired brain injury through physical trauma or stroke, for example, can result in impairments in motor function, language, cognition, sensory processing and emotional disturbances. Music therapy has been used within rehabilitation settings to stimulate brain functions involved in movement, cognition, speech, emotional regulation and sensory perceptions (Bradt, Magee, Dileo, Wheeler, & McGilloway, 2010). When combined with other traditional forms of rehabilitation, music therapy was found to improve emotional adjustment, anxiety, depression, and executive functions (Thaut, Gardiner, Holmberg, Horwitz, Kent, Andrews, Donelan, & McIntosh, 2009). Active improvised music therapy may offer a supplementary form of treatment in the early rehabilitation of severely brain-injured patients during coma recovery. With many developed economies experiencing an aging demographic alongside increasing numbers of older people living in isolation, music therapy has important implications in terms of enhancing the lives of older people. A compelling body of research demonstrates that music continues to offer powerful potential for enhancing health and well-being in old age. Active music-making provides a source of enjoyment and empowerment throughout these latter stages of adult life (Creech, Hallam, McQueen, & Varvarigou, 2013). This form of therapy is often positively received by elderly residents who report enhanced quality of life, more energy and motivation (Chen, Lin & Jane, 2009). Therapy sessions can add much needed variety, autonomy, and improve cognitive function while nurturing personal well-being. Within the realm of serious mental disorders such as schizophrenia, the aim of music therapy is to assist in the improvement of emotional and relational competencies and address issues sufferers of these disorders may not be able to verbalize. Additional research into the combined use of music therapy and antipsychotic medications in schizophrenia suggested a significant decrease in reported negative symptoms such as sluggishness, blunted affect, and poverty-of-thought when compared to medication alone. There was also a significant reduction of severity of psychiatric disability within three months of starting the music sessions (Yang, Li, Weng, Zhang, & Ma, 1998). Music therapy has a powerful impact on the communication behaviors of young people with profound developmental needs, particularly when compared to toy play sessions. Music is, at its very core, a nonverbal entity that allows for the expression of emotion without spoken words. Thompson & McFerran (2015) observed successful engagement and increased communication behaviors when involved in music therapy compared to more rejecting behaviors when engaging in toy play. Music interventions involving people with special needs have also been found to be effective in promoting positive parent-child relationships, reducing self-injury and aggression towards others while improving psychological well-being and enhancing quality of life (Nicholson, Berthelsen, Abad, Williams & Bradley, 2008). A diagnosis of cancer is one of the most feared and serious life events that can cause stress not only for the individual receiving the diagnosis but also their family and friends. Music therapy as an accompaniment to medical treatment has many benefits for cancer patients and can be used to improve mood, decrease stress, pain, anxiety, and enhance relaxation (Stanczyk, 2011). Interactive music therapy patients are encouraged to describe their experiences through active engagement with music. Patients and families who participate in live music concerts often experience a mood of peace and relaxation alongside improvements to comfort levels and the ability to convey emotion (Kenyon, 2007). Interactive techniques such as improvisation and playing instruments can also facilitate an internal locus of control, improve communication and self-expression (Stanczyk, 2011). Passive music therapy such as listening to live or recorded music can help take patients’ minds away from the discomfort caused by aggressive chemotherapy treatment, while simultaneously helping to cope with high levels of stress, fear and loneliness (Stanczyk, 2011). These techniques have also been found to lower self-reported levels of pain, improve heart and respiratory rates, and lower anxiety in children with cancer undergoing lumbar puncture procedures (Nguyen, Nilsson, Hellstrom, & Bengtson, 2010). Receptive music therapy, in which the patient listens to recorded or live music in order to achieve a desired outcome, such as reduced anxiety, is most appropriate in circumstances where active music participation is not possible or desirable, as in palliative care (Thompson, 2009). The primary goal of palliative care is to promote quality of life by ameliorating the social, emotional, cognitive, physical, and spiritual distress brought about by anxiety, isolation, and depression associated with life-limiting illnesses (Hilliard, 2005). In hospice and palliative care, music therapists use methods such as song writing, improvisation, singing, and music therapy relaxation techniques to treat the many needs of patients receiving care and their families. Music therapy techniques, even single sessions, have been found to reduce symptoms such as anxiety, pain, depression, physical discomfort, and improve relaxation (Bowers & Wetsel, 2014). Music can offer those receiving palliative and hospice care with an emotional outlet – a way to express what they are feeling without the need to put it into words. There is a long tradition of using music to cultivate resilience and facilitate healing in the wake of violence and oppression. Throughout history, music has been viewed as a healing force. The introduction of communal music therapy to adolescents in post-apartheid South Africa led to self-reported reductions of anxiety, stress, and fear in the aftermath of violence (Pavlicevic, 1999). The use of music to promote a positive psychological state – whether consciously or not – predates modern psychology and has roots stretching back centuries and around the globe. To this day, Indigenous Native Americans gather together to treat physical and emotional disorders through music and rhythm. The ancient, percussive music-centered Ngoma healing ritual is still used across central and southern Africa. Vegetalista shamans of the Ucayali region in Peru use chanting as a primary tool through which healing takes place. Research demonstrates that emotional responses to music are neurally mediated, insofar as listening to music activates areas of the brain concerned with reward, pleasure, and emotional processing (Koelsch 2009). Tibetan singing bowl meditation and other acoustic resonator techniques have been used in healing rituals to invoke deep relaxation, meditation and enlightenment since around 500 B.C. The rich, undulating deep tones have been found to significantly increase spiritual well-being, lessen tension, anger, and fatigue (Goldsby, Goldsby, McWaters & Mills, 2016). The use of music in healing brings emotional, artistic, and spiritual dimensions to learning and often complements the biomedical view by focusing on the individual in addition to the symptoms (Stuckey & Nobel, 2010). While Lily was a healthy baby weighing 3.63 kg, she did not babble or coo as an infant and was described by her parents as a ‘quiet baby’. Early developmental milestones were initially within normal limits. However, her parents began to notice problems in the areas of gross motor movement and speech – Lily did not attempt the vocalization of any sounds, with the exception of occasional squeals and screams. Over 24 weeks Lily attended carefully planned music therapy sessions that included activities such as the exploration of the different instruments, turn-taking, choosing music for each session, and the use of visual and interactive aids. By the end of session 4 Lilly was independently vocalizing the consonant sounds of ‘bah’ and ‘puh’ to communicate she wanted to play the instruments that began with that sound. By session 8 interactive interventions (toys, visual aids, blowing bubbles) were introduced to the sessions, and Lily began to demonstrate a greater increase in vocalization and communication skills. By session 9, Lily demonstrated an increase in attentiveness, socialization skills, interaction with the clinician, independent turn-taking skills, and attentiveness to new instruments. Lily’s communicative methods at the beginning of her treatment process were almost exclusively non-verbal. By the final session, she had demonstrated a significant increase in both cognitive and vocalization abilities. The combination of music, visual and interactive aids and an engaging, playful dialogue appeared to improve Lily’s capacity for verbal communication, socialization, cognitive/emotional, and motor skills/movement. Family-based Music Therapy After Domestic Violence – Pasiali (2013). After a history of childhood abuse by her grandfather and a violent 3 year marriage, Lalenia (a 35 year old woman) separated from her husband and showed symptoms of PTSD and depression. Her two children, Larna (age 3) and Lindy (age 18 months), had also experienced physical abuse from their father. Larna began to display challenging behavior, apathy, low self-esteem, aggression, pulling her own hair, lack of trust, and avoidance of physical touch. Lalenia and Larna’s experience of interactions evolved in an environment of fear and mistrust as a result of violence and abuse, and created the context for how they interacted together in the present. In music therapy, the family initially experienced difﬁculty in sustaining joint-attention interactions. Perceiving that they were likely to have negative emotions, they coped by shifting their attention, distracting themselves toward something else, or disengaging from the activity entirely. By the end of 8 music sessions, Larna began to exhibit signs of reciprocity and increased desire to participate in the sessions. Gradually she learned to initiate spontaneous play interaction through imitation and asking her brother to play an instrument with her. With each session Larna engaged in more family activities out with the music sessions. Participation in the family music therapy helped Lalenia and Larna in healing some of the damage in their relationship. I hope after reading this article, you too have come to appreciate that the more we explore expression through music, the better we understand the healing power of rhythm and the relationship between music, communication and healing. Why not pick up your guitar or listen to your favorite piece of music, you won’t regret it. Andrews, G., Howie, P.M., Dozsa, M., & Guitar, B.E. (1982). Stuttering: speech pattern characteristics under fluency-inducing conditions. Journal of Speech and Hearing Research, 25(2), 208-16. Autistic Spectrum Disorder (2014). Centers for Disease Control and Prevention: Data & Statistics. Retrieved from https://www.cdc.gov/ncbddd/autism/data.html. Baines, S. & Danko, G. (2010). Community Music Therapy in Community Mental Health: A Consumer Initiated Song-Based Paradigm. Canadian Journal for Music Therapy, 16. Barkley, R. A. (1998). Attention-Deficit Hyperactivity Disorder. Scientific American, 279, 66-71. Beathard, B. & Krout, R. (2008). A music therapy clinical case study of a girl with childhood apraxia of speech: Finding Lily's voice. The Arts in Psychotherapy, 35, 107-116. Boso, M., Emanuele, E., Minazzi, V., Abbamonte, M., & Politi,P. ( 2007).Effect of long-term interactive music therapy on behavior profile and musical skills in young adults with severe autism. The journal of alternative and complimentary medicine, 13, 709-712. Bowers, T. & Wetsel, M. (2014). Utilization of Music Therapy in Palliative and Hospice Care. Journal of Hospice & Palliative Nursing, 16, 231-239. Bradt, J., Magee, W., Dileo, C., Wheeler, B., & Mcgilloway, E. (2010). 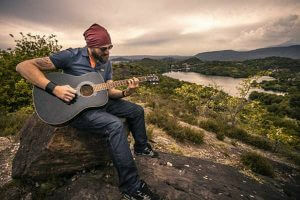 Music therapy for acquired brain injury. Cochrane database of systematic reviews (Online). 7. CD006787. 10.1002/14651858.CD006787.pub2. Bruscia, K. E. (1998). Defining music therapy. Gilsum NH: Barcelona Publishers. Castillo-Perez, S., Gomez-Perez, V., Velasco, M.C., Perez-Campos, E., & Mayoral, M.A. 2010). Effects of music therapy on depression compared with psychotherapy. The arts in psychotherapy, 37, 387-390. Chanda, M.L. & Levitin, D.J. (2013). The neurochemistry of music. Trends in cognitive science, 17, 179-190. Chen, S.L., Lin, H.C., & Jane, S.W. (2009). Perceptions of group music therapy among elderly nursing home residents in Taiwan. Complementary therapies in medicine, 17, 190-195. Chlan, L. (1998). Effectiveness of a music therapy intervention on relaxation and anxiety for patients receiving ventilatory assistance. Heart & Lung, 27, 169-176. Clift, S. (2012). Singing, well-being and health. In MacDonald, R., Kreutz, G., & Mitchell, L. (Eds). Music, health & well-being. Oxford: Oxford University Press. Creech, A., Hallam, S., McQueen, H. & Varvarigou, M. (2013). The power of music in the lives of older adults. Research studies in music education, 35, 87-102. Formisano, R., Vinicola, V., Penta, F., Matteis, M., Brunelli, S., & Weckel, J.W. (2001). Active music therapy in the rehabilitation of severe brain injured patients during coma recovery. Annali dell'Istituto superiore di sanita, 37(4), 627-30. Ghetti, C.M. (2004). Incorporating music therapy into the harm reduction approach to managing substance use problem. Music Therapy Perspectives, 22, 84–90. Goldsby, T.L., Goldsby, M.E., McWaters, M., & Mills, P.J. (2016). Effects of singing bowl meditation on mood, tension, and well-being: An observational study. Journal of evidence based integrative medicine, 22, 401-406. doi: 10.1177/2156587216668109. Gooding, L.F. (2011). The Effect of a Music Therapy Social Skills Training Program on Improving Social Competence in Children and Adolescents with Social Skills Deficits. Journal of Music Therapy, 48, 440–462. Heaton, P., Hermelin, B., & Pring, L. (1999). Can children with autistic spectrum disorders perceive affect in music? An experimental investigation. Psychological medicine, 29, 1405-1410. Hilliard, R. E. (2005). Music Therapy in Hospice and Palliative Care: a Review of the Empirical Data. Evidence-based complementary and alternative medicine, 2(2), 173-178. Hilliard, R. E. (2008). Music and Grief Work in CHildren and Adolescents. In Malchiodi (Ed.) Creative interventions with traumatized children. New York: The Guilford Press. Hillier, A., Greher, G., Poto, N., & Dougherty, M. (2011). Positive outcomes following participation in a music intervention for adolescents and young adults on the autism spectrum. Psychology of Music, 40, 201-215. 10.1177/0305735610386837. Iwata, B. A., Volmer, T. R., & Zarcone, J. R. (1993). The experimental functional analysis of behavioral disorders: methodology, application, and limitations. In Perspectives on the Use of Nonaversive and Aversive Interventions for Persons with Developmental Disabilities. Repp, A. C. & Singh, N. N. Sycamore, (Eds.). IL: Sycamore Press. Johnson, J. K., & Chow, M. L. (2015). Hearing and music in dementia. Handbook of Clinical Neurology, 129, 667-87. Kenyon, T. (2007). Effects of music therapy on surgical and cancer patients. Breast Care, 2, 217–220. Kim, J., Wigram, T., & Gold, C. (2009). Emotional, motivational and interpersonal responsiveness of children with autism in improvisational music therapy. Autism: The International Journal of research and Practice, 13, 389-409. Koelsch, S. (2009). A neuroscientific perspective on music therapy. Annals of the New York Academy of Sciences, 1169, 374–384. Krauss, T. & Galloway, H. (1982). Melodic Intonation Therapy with Language Delayed Apraxic Children. Journal of Music Therapy, 19, 102–113. Landis-Shack, N., Heinz, A.J., & Bonn-Miller, M.O. (2017). Music Therapy for Posttraumatic Stress in Adults: A Theoretical Review. Psychomusicology, 27, 334-342. Lewis-Hodgson, D. (2011). Weightless - the most relaxing track ever. Retrieved from: http://www.lyzcooper.com/projects.html and https://www.britishacademyofsoundtherapy.com. Malchiodi, C.A. (2016). Creative arts therapy in older adults. In Lavretsky, H., Sajatovic, M., & Reynolds, C.F. (Eds.). Complementary and integrative therapies for mental health. New York: Oxford University Press. McCaffrey, T., Edwards, J., & Fannon, D. (2011). Is there a role for music therapy in the recovery approach in mental health? The Arts in Psychotherapy, 38, 185-189. Nguyen, T.N., Nilsson, S., Hellstrom, A.L., & Bengtson, A. (2010). Music therapy to reduce pain and anxiety in children with cancer undergoing lumbar puncture: A randomized clinical trial. Journal of Pediatric Oncology nursing, 27, 146-155. Nicholson, J.M., Berthelsen, D., Abad, V., Williams, K., & Bradley, J. (2008). Impact of music therapy to promote positive parenting and child development. Journal of Health Psychology, 13, 226-238. O'Kelly, J., James L., Palaniappan R., Taborin J., Fachner J., & Magee W. L. (2013). Neurophysiological and behavioral responses to music therapy in vegetative and minimally conscious states. Frontiers in Human Neuroscience, 7, 884. Olderog-Millard, K.A. & Smith, J.M. (1989). The Influence of Group Singing Therapy on the Behavior of Alzheimer's Disease Patients. Journal of Music Therapy, 26, 58–70. Pavlicevic, M. (1999). Music therapy improvisation groups with adults: Towards de-stressing in South Africa. South African Journal of Psychology, 29, 94–99. Pasiali, V. (2013). A Clinical Case Study of Family-Based Music Therapy. Journal of Creativity in Mental Health, 8, 249-264. 10.1080/15401383.2013.821925. Podolsky, E. (1954). Music and Mental Health. Mental health (London), 13(3), 99-109. Raglio, A., Bellelli, G., Traficante, D., Gianotti, M., Ubezio, C., Villani, D. & Trabucchi, M. (2008). The Efficacy of Music Therapy in the Treatment of Behavioral and Psychiatric Symptoms of Dementia. Alzheimer disease and associated disorders, 22, 158-62. Rickson, D.J. (2006). Instructional and Improvisational Models of Music Therapy with Adolescents Who Have Attention Deficit Hyperactivity Disorder (ADHD): A Comparison of the Effects on Motor Impulsivity. Journal of music therapy, 42, 39-62. Rio, R. (2005). Adults in recovery: A year with members of the choir house. Nordic Journal of Music Therapy, 14, 107–119. Sawami, K., Kitamura, T., & Suishu, C. (2018). Effects of cognitive training by music therapy. Journal of psychiatric disorders, 2, 167-178. Silverman, M.J. (2015). Effects of lyric analysis interventions on treatment motivation in patients on a detoxification unit: A randomized effectiveness study. Journal of Music Therapy, 52, 117–134. Smith, J.C. (2004). Alterations in brain and immune function produced by mindfulness meditation: Three caveats. Psychosomatic Medicine, 66, 148. Stuckey, H. L., & Nobel, J. (2010). The connection between art, healing, and public health: a review of current literature. American Journal of Public Health, 100(2), 254-63. Suda, M., Morimoto, K., Obata, A., Koizumi, H., & Maki, A. (2008). Emotional responses to music: towards scientific perspectives on music therapy. Neuroreport, 19(1), 75-8. Tannock, R. (1998). Attention deficit hyperactivity disorder: Advances in cognitive, neurobiological, and genetic research. Journal of Child Psychology & Psychiatry, 39, 65-99. Thaut, M. H. (2005) The future of music in therapy and medicine. Annals of the New York Academy of Science, 1060, 303–308. Thaut, M. H. (2008). Rhythm, music, and the brain: Scientific foundations and clinical applications. New York: Taylor & Francis. Thaut, M.H., Gardiner, C.J., Holmberg, D., Horwitz, J., Kent, L., Andrews, G., Donelan, B., & McIntosh, R.G. (2009). Neurologic Music Therapy Improves Executive Function and Emotional Adjustment in Traumatic Brain Injury Rehabilitation. Annals of the New York Academy of Sciences, 1169, 406-16. 10.1111/j.1749-6632.2009.04585.x. Thaut, M.H. & Hoemberg, V. (2014). Handbook of Neurologic Music Therapy. Oxford, UK: Oxford University Press. Thoma, M.V., Marca, R.L., Brönnimann, R., Finkel, L., Ehlert, U., & Nater, U.M. (2013). The Effect of Music on the Human Stress Response. PloS one, 8(8). Retrieved from: https://journals.plos.org/plosone/article?id=10.1371/journal.pone.0070156. Thompson, W. (2009). Music, thought and feeling: Understanding the psychology of music. Oxford: Oxford University Press. Thompson, G.A. & McFerran, K.S. (2015). Music therapy with young people who have profound intellectual and developmental disability: Four case studies exploring communication and engagement within musical interactions. Journal of Intellectual & Developmental Disability, 40, 1-11. Trainor, L.J. & Zatorre, R.J. (2016). The Neurobiology of musical expectations. In The Oxford Handbook of Music Psychology, Hallam, S., Cross, I., & Thaut, M. (Eds). Oxford: Oxford University Press. Ulrich, G., Houtsman, T., & Gold, C. (2007). The additional therapeutic effect of group music therapy for schizophrenic patients: a randomized study. Acta psychiatrica Scandanavica, 116(5). Vanhaudenhuyse, A., Demertzi, A., Schabus, M., Noirhomme, Q., Bredart, S., & Boly, M. (2010). Two distinct neuronal networks mediate the awareness of environment and of self. Journal of Cognitive Neuroscience, 23, 570–578. World Health Organization. (n.d.). Depression and Other Common Mental Disorders. Global Health Estimates. Retrieved from: https://apps.who.int/iris/bitstream/handle/10665/254610/WHO-MSD-MER-2017.2-eng.pdf?sequence=1. Yang, W.Y., Li, Z., Weng, Y.Z., Zhang, H.Y. & Ma, B. (1998). Psychosocial rehabilitation effects of music therapy in chronic schizophrenia. Hong Kong Journal of Psychiatry, 8, 38-40. What is Positive Psychology & Why is It Important? Originally from Ireland, Elaine Houston is an independent business owner and Behavioral Science graduate with an honors degree from the University of Abertay, Scotland. After graduating, Elaine developed her passion for psychology through a range of avenues, focusing on consumer and small business psychology before going on to work within her local community as a learning and development officer. When she isn’t working, Elaine enjoys exploring creative outlets such as painting, drawing, and photography.